It’s Christmas Eve and it’s sticky, muggy, humid, hot. The air is thick and still beneath the high wispy cloud – so typical this change in the weather after my last post despairing of Wellington’s Christmas climate. Long may it continue, until tomorrow at least. Today we have made fruit and nut truffles of the whole food kind – walnuts and sunflower seeds blended until gritty then bound together with prunes, dried apricots, raisins and a glug of brandy. We have iced the Christmas cake with brandy butter icing; Christmas smells of brandy in our house. Today we made mayonnaise for our hot smoked salmon hors d’oeuvres platter we are having tomorrow. On one of our first truly hot days Mum and I decided to whip, vigourously I might add, home made mayonnaise. Michael Bublé’s Christmas album took a welcome break and The Eagles, Pearl Jam and Leonard Cohen’s Hallelujah played as we whisked and coaxed a buttercup yellow egg yolk and olive oil into beautifully thick, rich and bright mayo. Droplets of sweat appeared on our foreheads and our arms ached, but goodness, that mayonnaise, I could eat it with a spoon. Tomorrow will be delicious. On Friday we had our Christmas dinner with Ollie and Jason at their flat. A de-constructed Christmas tree is tacked to their kitchen walls, fairy lights are woven among branches, candy canes hooked between sprigs and baubles hang from the ceiling. We drank bubbles and pulled Christmas crackers; it felt very festive. The boys cooked an absolute feast that we devoured with greed, each mouthful taken with a hmm and aah, and exclamations of “these potatoes!” “these beans and olives!” “this chicken!” Ollie makes the best roast chicken: moist and tender with crispy skin. There were potatoes roasted in duck fat to a crisp outside with soft white insides; a vegetable tian with eggplant, tomatoes, zucchini, garlic and herbs; and green beans lightly sautéed to bright forest green in colour with black olives, lemon and garlic. For dessert Jason made the best lemon tart I have ever eaten. The filling was thick, high on the pastry and luxuriously creamy like a custard with the sweet tang of lemon. It was light yet rich, sweet yet thrillingly citric, the way only a good lemon tart can be. For dessert I made an upside down pear ricotta and lemon cake. We hardly needed two desserts but the idea for this cake had crept into my head and wouldn’t leave. After Christmas tea and episodes of 30 Rock this cake became our midnight feast. I roasted slices of bosc pears in butter, brown sugar and a little salt until they become slips of sweet juicy fruit. I layered these on the bottom of the pan, a haphazard layering far from a delicate spiral, with the lemon ricotta mix on top. The ricotta lends the texture of ground almonds and gives an open crumb. The cake beneath the pale pears is buttery in colour and in flavour – the smooth, rich butter flavour that becomes soft and sweet in the oven. This is the same mellow butteriness that can be found in a good Chardonnay, in a pear itself and perhaps, even, a tissue thin slice of prosciutto or salami. There is comfort to be found in this buttery warmth, even when it is nearly 100% humidity. The ricotta cake base I adapted from a recipe I found on the BBC Good Food website: a wonderful site and one of my most trusted sources of online recipes. A few extra notes: I used defrosted ricotta which I had frozen a few weeks ago. It worked fine but I made sure to squeeze any extra moisture out before adding to the mix. Pre-heat oven to 180°C. Place the sliced pears in a roasting dish with the butter, sugar and salt and roast until tender. About 20-30 minutes. Line a 20cm cake tin with baking paper. Meanwhile prepare the ricotta cake mix. In a bowl cream the butter and sugar together until pale and smooth. Then beat in the lemon zest, egg yolks and ricotta. In a clean dry bowl using clean beaters beat the egg whites until stiff peaks form, then fold into the ricotta mixture. Sift the flour and baking powder together then fold into the cake mixture until just combined. Once the pears have roasted use tongs to layer the pear slices with on the bottom of the cake tin with the least amount of excess juices as possible. Sprinkle over a teaspoon of brown sugar. On top of the pears pour the cake mixture and smooth. Bake in the oven for 35-45 minutes until golden brown and a skewer inserted in the middle comes out clean. Leave to cool in the tin for one hour before turning upside down onto a serving plate. Serve with cream or yoghurt. I remember one particular Christmas day when I was probably about 8 or 9 and it was hot. I was given bright yellow togs (swim suit) for Christmas that had a keyhole clasp at the back and I think they had a brocade like pattern on them. I swam in those togs until they near wore through and the bright yellow faded to the colour of butter. But that Christmas we spent all day in the garden playing petanque and in the afternoon we turned on the sprinkler and christened our new togs. I remember these togs so fondly for this was possibly the last Christmas day of endless hot sunshine. The next year we were in long sleeves and jeans. And every year since then our summer in Wellington seems to have shifted and come Christmas we are still plagued by spring winds and the accompanying unpredictability. Last week we had two days of 25 degrees and it was glorious. Everyone was optimistic for a hot, even if brief, summer. But north of New Zealand cyclone Evan lashes the islands of the Pacific and the cyclone’s most southern tendrils might just whip the North Island by the end of the week. Two days ago, from the hills down to the harbour, Wellington was shrouded beneath a thick fog. When we wait with trepidation nearly every year to see what Christmas weather will bring, knowing it’s likely to be dull, it seems quite sensible for Christmas to be in winter. A day spent inside with a lit fire, hot drinks, heavy roasts and biscuits scented with the most warming of spices. But down here in the south Pacific we hang on desperately to this idyllic image of a barbecue Christmas playing beach cricket and wearing t-shirt and shorts. In Wellington we should find a happy medium. I’m guessing we’ll find this through food, somewhere between the spinach and tarragon stuffed turkey breast wrapped in bacon and the bright red strawberries and soft raspberries. However, after all that hand wringing and lamenting at the often appalling Wellington climate which, I’m sorry, seems such a feature of this blog, there are a few Christmas mainstays no matter which you hemisphere you reside: Christmas cookies. I like the romance and the heady spice of an Italian or German Christmas biscuit; spiked with citrus, perhaps of the candied variety, and almost potent with cinnamon, ginger, mace and cloves. But it is the decidedly more British biscuit, the shortbread, that caught my attention this year. Whether the Scots believe in adding ground almonds, orange zest and a splash of orange blossom water to their beloved shortbread is yet to be investigated, but I definitely do. These biscuits are good; it’s barely half six in the morning and I’ve already eaten two, contemplating the crispness, the shortness, if you will, of the biscuit. There is the smallest of shatters as you bite beneath the almond crust, and the familiar flavour of buttery, mellow shortbread comes to the fore. But then there is something else entirely – the sweet zest of orange, the woody green hint of cloves and the dab of orange blossom water brushed onto the surface of the hot biscuits whispers floral notes. It’s strangely Christmas-y in this regard, perhaps of the southern hemisphere sort with summer flowers and our native Christmas tree. Recipe heavily adapted from here. It is best to be timid when brushing the liquid onto the hot biscuits. The almond is a subtle flavour and you don’t want anything too overpowering nor do you want to soften the biscuit. 80 grams ground almonds (plus extra for dusting and rolling). Cream the butter and the icing sugar until pale and creamy. Sift the dry ingredients plus the orange zest. Mix with a spoon or your hands until just combined. On a clean dry surface sprinkle ground almonds and turn out shortbread mixture. Roll dough through the ground almonds and form into a long sausage shape, wrap in cling film and refrigerate for 20-30 minutes. In the meantime pre-heat the oven to 160°C and line a baking tray. Unwrap the dough and slice into 1.5 centimetre rounds. Place on a baking tray and bake for 15 minutes. Once the biscuits have been removed from the oven use a pastry brush to lightly brush on orange blossom water or another orange liqueur like Cointreau. Leave to cool for 30 minutes before dusting in icing sugar if you choose. It’s nearly Christmas which in a strange contradictory way feels like it should come as a great shock, as in “good grief, what happened to November, or the rest of the year for that matter?”, but at the same time I feel I can wave my hand nonchalantly and say Christmas schmistmas (try saying that out loud, difficult.) Not because I don’t care and not because I don’t crave more than anything a day or two to spend with family and friends eating and drinking, but because when it all boils down, that’s really all we need to worry about in our house – the food and the wine. In November blog readers around the world were inundated with Thanksgiving recipes and stories and photographs of turkey. Most writers spoke of the comfort that can be found in having the traditional Thanksgiving menu year after year, while other writers posted recipes for the new and the different. After several weeks of pumpkin pie recipes and cranberry sauce and tales of gathering at the family table I had had enough. If I read another turkey stuffing recipe or ideas for how to use the leftovers I might have screamed. My animosity towards Thanksgiving might very well stem from jealousy, I’ll be the first to admit it. I would love another holiday so close to Christmas, another opportunity to cook and eat with the people I love, but I must wait to Christmas here. So I became eager and excited for the days when our family could plan our Christmas meal. We usually try new things, experiment with new flavours. There are special ingredients, like scallops, that we save for days like Christmas but otherwise the wonderful thing about our Christmas table is the food doesn’t seem too far from our everyday. This makes our Christmas menu sound a bit boring, perhaps? As if quick week night meals were on par with our Christmas fare. The difference between the everyday and Christmas is time – we have all day to prepare our meal. We spend the day pottering and tinkering about in the kitchen, occasionally taking breaks to eat chocolates, pour more bubbles, open presents or lounge in the sun (the joys of a southern hemisphere Christmas). Then, suddenly it’s 2 in the afternoon and our table is full. I love the rituals of our Christmas, the unstated guidelines our family has about how long to spend in your pyjamas in the morning, how we set the table, the bowls of chocolates or roasted nuts for people to pick at during the day and the annual trip to Kirk’s Christmas shop to choose our decoration. This reflection on Thanksgiving and Christmas, family and food, prompted me to think of my family’s favourite recipes – the ones held constant throughout my life. There are quite a few on this list but whether they were held constant in the reality of my childhood or whether I have fabricated their near perpetual existence in my memory, as I am prone to doing, I cannot say. But they are good and I hope to share them all here, one day. First though is the chocolate oat cookie, revered in Lowe family lore. All four of us have made this recipe countless times and nearly every time the cookies have turned out differently. Someone may have added too much butter and the biscuits become flat crisps. Other times perhaps the butter and sugar were not creamed properly, or maybe a smidge too much baking powder and we have high, fluffy, scone like biscuits. Every time these biscuits have been good, perhaps made in haste but never without love. These inconsistencies are not a fault of the recipe, instead they are testament that with chocolate, oats and butter there is not a lot that can go wrong. Sometimes these biscuits have been made with chocolate chips, other times with a roughly chopped block of dark chocolate. A few times we have abandoned the chocolate altogether and used raisins instead. These days roughly chopped Whittaker’s dark chocolate is the way to go; the hunks of chocolate are molten fresh from the oven but hold their shape within a thin seal ready to burst into warm fudge as you bite through. The binding flavour here, what differentiates this cookie from a regular chocolate chip, is not the chocolate used, or the (significant) quantity of butter, or the addition of sweetened condensed milk, but the oats. That nutty, soft flavour I find irresistible in so many things seems to bring me home every time I eat them. Chocolate oat cookies did that perhaps, and for that I am thankful. Once you’ve added the flour and the rolled oats, the ratio of dry to wet ingredients seems a bit out and the mixture too dry. Work it well with your hands or a really large spoon and all will be ok.
Pre-heat the oven to 180°C. Line a baking tray. Cream the butter, condensed milk and sugar together for at least 8 minutes. Add remaining ingredients and mix well. Cook for 15-20 minutes until a nice golden brown. There is a beauty in a salad that you will never find in a roasted leg of lamb, or a chicken curry, or a pasta dish no matter how good and how well made they are. There is a freedom of spirit in a salad. You can free wheel in the kitchen. Salads can be immensely satisfying – a meal in their own right. A roasted carrot salad has been brewing in my mind for a while now. I first fell in love with roasted carrots while living in France. Often at the local market a 2 kilogram bag of carrots would be a euro or two. I would eat raw carrots like a rabbit, only turning to other carrot recipes when, alarmingly, my finger tips began to look like I had rubbed them in tumeric. I made carrot soup sweetened with braised leeks or fresh orange juice or, alternatively bulked up with potatoes. And then, when I reached the the end of my tether for carrot and orange soup – who knew there was such a tether? roasting became the way to go. Cut into long strips the carrots char slightly at the thinner edges while the thicker end near the top of the carrots maintain their soft bite. Roasted carrots, while not the prettiest roast vegetable to look at all withered and wrinkly, they are perhaps the best to eat. They are sweet and if well seasoned with good oil and salt and pepper take on a buttery, salty-sweet flavour. In France I would eat them simply straight from the roasting dish, pulling each long wedge from the soft tangle of burnt orange. Or I would pulse them into hummus with a pinch of cayenne and paprika, then slather it on fresh, crusty bread with sliced tomato. It wasn’t until this winter with bags of carrots seeming to outnumber potatoes, pumpkin and other roastable vegetables that I rediscovered the roasted carrot. I like the shape of a roasted carrot, long and slender. A carrot roasted to tenderness and vibrant orange seems quite different and elegant lying next to round, pale golden potatoes. The inspiration for this carrot salad came from a Ruth Pretty recipe I have always been fond of. The carrots are tender, boiled perhaps as they are less caramel tasting and more mellow, but are zinged up with plenty of chilli, olives, and coriander. I love the heat of the chilli, the acidity of the olives and the freshness of the coriander. For my salad I roasted everything together – beginning with a whole pan laden with chopped carrots and whole garlic cloves, then twice opening the oven to toss in chopped red chilli and Kalamata olives. Next time I might toss in almonds to roast for the last few minutes to add a bit of crunch. The quinoa salad is more of an everything salad; endlessly versatile. Start with a base of cooked quinoa – I used a red, black and white mix – and add whatever you have on hand. Sautéed asparagus with lemon, feta, sundried tomatoes, red and yellow capsicum finely diced, sunflower seeds, fresh mint, chopped tomatoes and zuchini rounds cooked until soft and floppy together with fresh basil leaves. The extra bits and pieces nestle well in the tiny fronds of the quinoa and their soft nutty flavour is the ideal vehicle for stronger tastes and textures. Go wild. A large amount of carrots, say a kilo or so. Pre-heat oven to 180°C. Chop carrots in half lengthwise then into quarters lengthwise until you have long strips. Place the carrots and the peeled garlic cloves in a roasting pan with a generous slug of olive oil and salt and pepper. Roast for 30 minutes then add the finely diced chilli. After another 10 minutes add the olives and continue to cook for another 10 to 15 minutes. Garnish with chopped coriander. This colour! Look at it! It seems more likely the colour of a winter scarf – the burst of colour tucked under the collar of a dark coat. Or perhaps the colour of a beach kaftan – sort of lustful and carefree all at once like a day spent at the beach with nothing to do but swim and lie in the warmth. This is what is on my mind at the moment. This deep fuchsia could be a berry sorbet or a berry muddle in a cool glass ready for mint, gin and soda. This is also on my mind at the moment. But in a similar thread to the last post what is really at the forefront of my mind is healthful good food so I can keep going, keep working, keep healthy. Days spent at the beach in the warmth of the sun and nights spent with good friends and berry gin drinks are a while away yet. But that’s ok. We are winding down to the end of the year, and whew, it’s been a quick fire busy year. To see the peak of the rise, the grass on the other side, if you like, is an extra little nudge towards longer hours and full days. For as well as that green grass on the other side I can see the energy I have when I work well and the fitness I have gained from being on my feet for so many hours a day. I can see the health of my bank account(! ), and the renewed will to be more organised and to live as well as I can. I have been thinking a lot about the way we work; what it means to work and to earn a living. I know a lot of people who have recently graduated from university or are about to and are deciding how to live and how to work; grappling with life decisions. To choose how we live within our income, whatever amount that may be, is how I want to approach my life. The 9 to 5 working day may never be how I choose to live and to earn but this means I can make beetroot hummus, or go for a swim, or meet a friend for coffee before starting my work later in the day. You get used to this backwards sort of day. The morning I made this hummus the light was shifty and high in the sky being buffeted and lifted by the wind. I wrapped the beetroot in tinfoil with a bit of oil and a good grinding of salt and pepper. As they roasted I could hear the sizzle and the spit within the foil parcel. It sounded like drizzly rain inside my oven; slightly disconcerting at first, but after a while rather comforting. The sweet earthy smell, slightly herbaceous and vaguely of mushrooms, filled my kitchen. 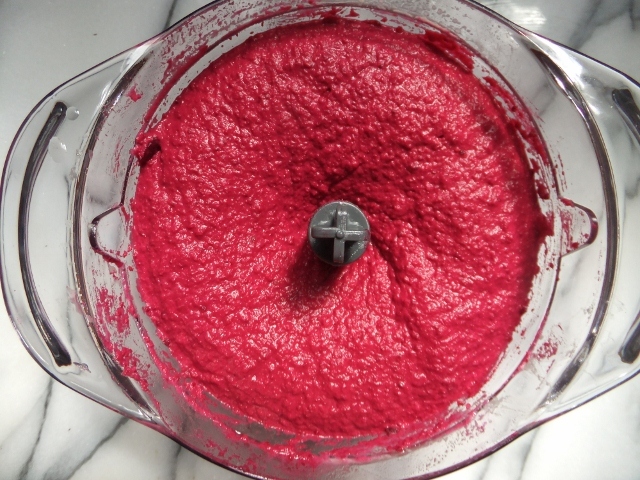 The first buzz of the blender as the roasted beetroot was added, deep red and almost translucent in its tenderness, and the colour that burst throughout the pale beige of the hummus made me smile and reach for my camera. A few photos too many for the light was difficult to work with and I was running a little late for work – it’s not all blissful morning cooking and coffee dates. There is a rush to squeeze what is probably a normal Sunday routine into the few short hours between waking and working at midday. But then I found myself at work – polishing glasses or making sandwiches – and thinking, dreaming, of this beautiful colour. To open my little lunch box during my break and see big dollops of bright, bright deep pink amongst my salad is cheering; a metaphorical clink of glasses, a toast to roasted beetroot hummus. I have a standard leaf salad I turn to time and time again; it’s my tried and true. You can’t beat the taste of fresh and clean and good – cucumber with snap and lettuce with crunch – but I think the virtue of salad, the feel good factor of salad is sometimes greater than the taste of lettuce leaf and diced vegetables. Sure, salads can be jazzed up – a sprinkle of sunflower seeds, cubes of feta and vinaigrette are always good ideas. But this beetroot hummus is the way to go, perfect for a working lunch. I used two large cloves of garlic and the heat of the garlic was a bit too strong and overwhelmed the sweetness of the beetroot. It did improve after a couple of days left to mellow. Next time I might try with one small clove, or leave the garlic out altogether. Also, I have watched my mother make hummus a hundred times and now make it following her very loose set of instructions. I am guided by a desired consistency – more like a thick soup than a thick paste – than by real measurements so the measures below are a rough guide only. Pre-heat the oven to 190°C. Cut the stalk end off the beetroot and discard. Place the beetroot in a piece of tin foil with salt and pepper and a generous drizzle of olive oil. Wrap the beetroot loosely but seal the tin foil well. Roast for an hour, then check to see if tender when inserted with a knife. (Careful of the steam when opening the foil parcel!) I roasted my beets for one hour and fifteen minutes. In a blender place the drained and rinsed can of chickpeas with the tahini, garlic, olive oil, salt and pepper and lemon juice and blend until quite smooth. 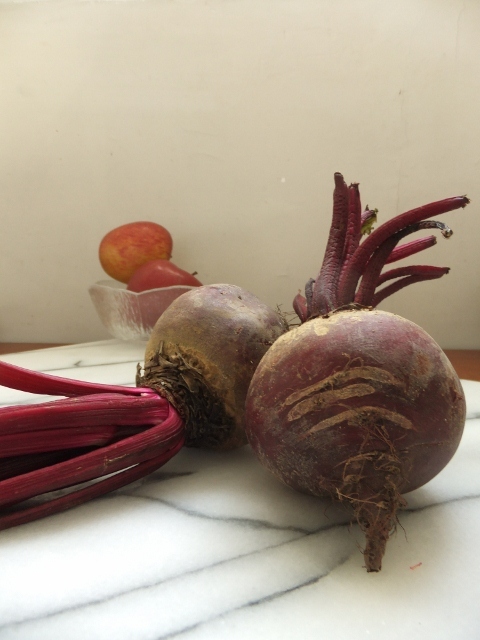 Once the beets have roasted, open the parcel and leave to cool enough to handle. 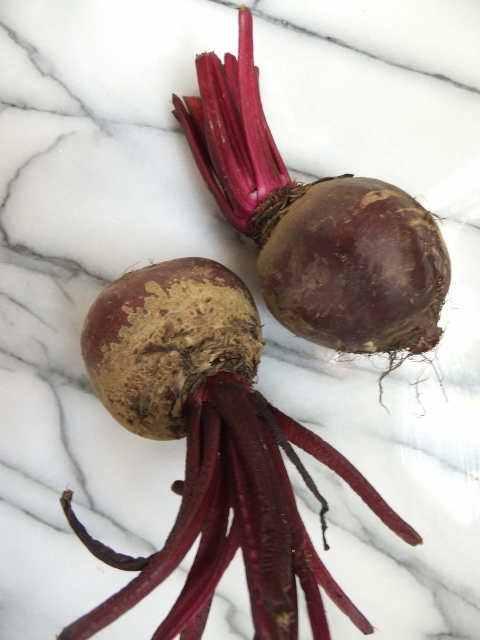 Gently peel off the skin of the beetroot – this should slip off easily. Dice the beetroot then add to the blender and blend until smooth. This makes a large amount of hummus but will keep in the fridge for a week.